Figure 1: Coherent motions widely exist in crowd. proposing an effective technique called Coherent Filtering for coherent motion detection in noisy time-series data. Coherent Neighbor Invariance characterizes the local spatiotemporal relationships of individuals in coherent motion. Invariance of spatiotemporal relationships. The neighborship of individuals with coherent motions tends to remain invariant over time. Invariance of velocity correlations. The velocity correlations of neighboring individuals with coherent motions remain high when being average over time. The following is the illustration of Coherent Neighbor Invariance. Figure 2: Illustration of CNI in K nearest neighbor (K=7).The green dots are the invariant K nearestneighbors of the central black dot over time (here K = 7). The invariant neighbors have a higher probability to be the dots moving coherently with the central dot, since their local spatiotemporal relationships and velocity correlations with the central dot are inclined to remain invariant over time. We further define two ratios to quantify Coherent Neighbor Invariance in K nearest neighbor through Random Dot Kinematogram, the existence of this prior is also verified. find K nearest neigbhor set at each time. find the invariant neighbor and pairwise connection set. 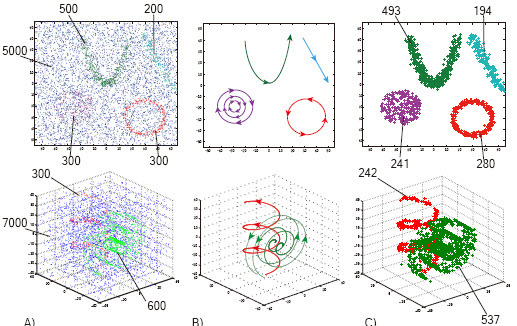 threshold pairwise connection set by the average velocity correlations, then generate connected components as the coherent motion clusters. Algorithm: CoheFilterDet for detecting coherent motion patterns. Since coherent motion clusters will continue and new cluster of coherent motion will emerge over time. Based on the temporal overlaps of trajectories we develop another algorithm CoheFilterAssoci to associate and update the clusters of coherent motion over consecutive frames. We evaluate the robustness and effectiveness of Coherent Filtering on synthetic data, Hopkins motion segmentation database, and crowd videos. On the synthetic data, we test the technique by detecting coherent motion patterns with different dynamics from high-density random walk noises. Figure 3: Coherent motion in synthetic data. A) The shapes and the numbers of coherently moving dots(colors indicate different coherent motion patterns) and noisy dots(in blue). B) The dynamic traces of each coherent motion patterns. C) The detected coherent motion patterns by Coherent Filtering. Then we evaluate the technique on the Hopkins155 Motion segmentation database. Figure 4: Segmentaiton results on Hopkins155 database. Experiments are conducted on 8 video clips with coherent motions emerging in different scales and distributions. Figure 5: Coherent motion clusters detected in real scenes. Demo video could be downloaded from here. And the data of original videos and trajectories can be downloaded from here.